The Budget proposes to raise the exemption limit by Rs 50,000 to Rs 2.5 lakh for all individual tax payers below 60 years of age and Rs 3 lakh for those who are above 60 but below 80. Finance Minister Arun Jaitley has announced many steps to lower the burden on individual taxpayers. These include raising the basic exemption limit, increasing Section 80C benefits and additional deduction on interest paid on home loans. These will help people in the 30% tax slab save up to Rs 36,050 a year. The benefit will be up to Rs 25,750 for those in the 20% tax slab and Rs 15,450 for those in the 10% tax slab. 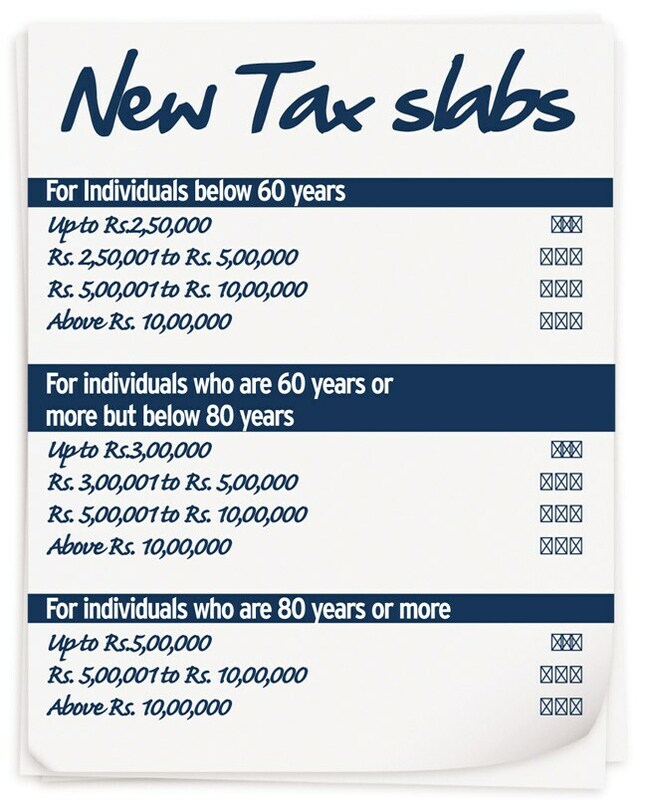 The Budget proposes to raise the exemption limit by Rs 50,000 to Rs 2.5 lakh for all individual tax payers below 60 years of age and Rs 3 lakh for those who are above 60 but below 80. The exemption limit for people above 80 years has been left unchanged at Rs 5 lakh. There is no change in the tax slabs. The 3% education cess has also not been touched. The finance minister has, however, not given relief to those with annual income of more than Rs 1 crore; the 10% surcharge levied in the last year's budget will continue. Individuals with more than Rs 1 crore annual income pay 33% tax. The cap on investments under Section 80C of the Income Tax Act has been raised from Rs 1 lakh to Rs 1.5 lakh. This was one of the longpending demands of the investing community. Under Section 80C, contributions to Public Provident Fund (PPF), Employee Provident Fund (EPF), National Savings Certificates (NSC), life insurance policies, tax-saving bank fixed deposits, Senior Citizen Savings Schemes (SCSS), tax-saving mutual funds and home loan principal are eligible for deduction while calculating the taxable income. "The increase in the basic exemption limit from Rs 2 lakh to Rs 2.5 lakh will benefit all individuals. The higher deduction under Section 80C will help the government achieve the twin objectives of encouraging households to go for long-term savings and increase the overall savings rate, which has fallen considerably over the last five years," says Vikas Vasal, Partner, Tax, KPMG India. However, the limit for employee contribution (maximum of 10% of basic salary) towards the National Pension System (NPS) under Section 80CCD will remain at Rs 1 lakh. The employer contribution (10% of the basic salary), if the person has subscribed to the NPS through the employer, will continue to be eligible for deduction over and above the overall limit of Rs 1.5 lakh. "The limit on employee contribution to the NPS has been kept at Rs 1 lakh even though the overall limit under Section 80C has been increased to Rs 1.5 lakh," says Deepak Jain, director and CEO, Taxmanager.in, an e-filing portal. The Pension Fund Regulatory and Development Authority (PFRDA) has, however, approached the Ministry of Finance for a higher Section 80C limit for NPS, similar to that for other such tax-saving instruments under the Section. "We have approached the Department of Revenue to allow higher deduction for NPS up to Rs 1.5 lakh under Section 80C," the acting chairman of the PFRDA, RV Verma, told Money Today. The increase in the Section 80C limit means you will have to allocate more money for tax-saving investments. You have to make that assessment if your budget allows you to allocate that extra sum in long-term tax-saving instruments. The investments should be made taking into account the overall portfolio and not just for the sake of saving tax. While choosing the investment, you should consider aspects such as potential returns, taxability at redemption and lock-in. Among the better tax-saving instruments under Section 80C are PPF, EPF and tax-saving mutual funds. Gains from all the three are not taxable at redemption. Interest earned on NSCs, SCSS and tax-saving fixed deposits is taxable. Ulips, due to high charges, and endowment insurance plans, because of low returns and long maturity periods, are not considered the best options for saving tax. The Budget has also given a big relief to home loan borrowers. It has raised the deduction limit for home loan interest payment for self-occupied properties from Rs 1.5 lakh to Rs 2 lakh. This not only help home borrowers save more money but also gives a boost to the real estate sector, which in the last couple of year have seen a slump in demand. "Given the rising cost of property, the limit of Rs 1.5 lakh was insufficient. The Budget has proposed an increase to Rs 2 lakh. It is a welcome move," says Tapati Ghose, Partner, Deloitte Haskins & Sells. Besides, the principal repayment limit (under Section 80C) has been increased from Rs 1 lakh to Rs 1.5 lakh. These two announcements have significantly increased the tax benefits for home loan borrowers. "This double benefit reduces the effective interest on Rs 25 lakh loan by one percentage point, which is equivalent to a 6% lower EMI," says a Nomura report. "Prices of properties have gone up in the last few years and, therefore, it is good time for some relief, even if it is on the tax front. The two benefits (increase in deduction limit on both principal and interest rate payments) will encourage people to buy houses," says Arun Singh, senior economist, Dun & Bradstreet India. For unoccupied or let-out property, full interest paid is eligible for deduction.